It’s a growing phenomenon among American families: fathers who cut back on paid work to focus on raising children. But what happens when dads stay home? What do stay-at-home fathers struggle with-and what do they rejoice in? How does taking up the mother’s traditional role affect a father’s relationship with his partner, children, and extended family? And what does stay-at-home fatherhood mean for the larger society? In chapters that alternate between large-scale analysis and intimate portraits of men and their families, journalist Jeremy Adam Smith traces the complications, myths, psychology, sociology, and history of a new set of social relationships with far-reaching implications. As the American economy faces its greatest crisis since the Great Depression, Smith reveals that many mothers today have the ability to support families and fathers are no longer narrowly defined by their ability to make money-they have the capacity to be caregivers as well. The result, Smith argues, is a startling evolutionary advance in the American family, one that will help families better survive the twenty-first century. As Smith explains, stay-at-home dads represent a logical culmination of fifty years of family change, from a time when the idea of men caring for children was literally inconceivable, to a new era when at-home dads are a small but growing part of the landscape. Their numbers and cultural importance will continue to rise-and Smith argues that they must rise, as the unstable, global, creative, technological economy makes flexible gender roles both more possible and more desirable. But the stories of real people form the heart of this book: couples from every part of the country and every walk of life. They range from working class to affluent, and they are black, white, Asian, and Latino. We meet Chien, who came to Kansas City as a refugee from the Vietnam War and today takes care of a growing family; Kent, a midwestern dad who nursed his son through life-threatening disabilities (and Kent’s wife, Misun, who has never doubted for a moment that breadwinning is the best thing she can do for her family); Ta-Nehisi, a writer in Harlem who sees involved fatherhood as “the ultimate service to black people“; Michael, a gay stay-at-home dad in Oakland who enjoys a profoundly loving and egalitarian partnership with his husband; and many others. Through their stories, we discover that as America has evolved and diversified, so has fatherhood. In 2004 my son Liko was born. Everything--the tree outside the window, the dreams I had at night--changed. For the first year of his life, my wife Olli stayed home with Liko. Then she went back to work and I quit my job, joining the ranks of caregiving dads. Now it was just the two of us boys, and it was scary. Liko, a confirmed breast addict, could not nap without his mother. When I would lay him down, he’d wail inconsolably, relentlessly, reaching out to me. But when I picked him up, he’d kick and arch his back, his little hands pushing against my chest. This would go on for hours. I’d put him in the stroller and walk. He’d cry and fall asleep, but if I stopped--in a bookstore, a coffee shop--he’d wake and cry again, so I soon learned to keep moving through our San Francisco neighborhood, sticking to the side streets, going up the hills and down, up and down. Time slowed, and with every minute I’d feel more and more isolated, more and more anxious. I wondered: “Is my life now no more than this” I’d see people laughing in a picture window and want to be one of them. In time, I learned to let that go, let myself get lost. On foggy days the hills of the city floated around us like deserted islands, the stroller a lonely raft. I’d study the cornices and gables on the Victorian facades, watch the tsunami of fog spill over Twin Peaks. Later, Liko learned to fall asleep in my arms. I’d carry him through all the rooms in our apartment, stepping carefully around the bouncy seat, the swing, the baby gym, the high chair, the toy basket. I’d do this for hours. Then one momentous day, I sat down in a rocking chair and he stayed asleep. I took a book down from the bookshelf. It was the best book I’d ever read; I don’t remember its name. One afternoon as the room darkened, his eyes snapped open and they met mine. He smiled and said, “Dada,” and his small fingers curled around my forefinger. He was glad to see me there with him. And I was glad to be there. In 2007 the Census Bureau counted 159,000 stay-at-home dads in the United States, up from 64,000 in 1995.2 But these numbers tell only part of the story of male caregiving, because they exclude stay-at-home fathers who also do paying work. When we add fathers who work part-time or from home, and who are primarily or equally responsible for taking care of kids, the number of male caregivers increases. According to a 2008 census report, for example, one in four preschool children spend more time in Dad’s care than any other arrangement while the mother is working,3 though most of the fathers work at least part-time and probably do not call themselves “stay-at-home dads.” Many studies find that twenty-first-century couples divide paid work, household labor, and child care far more equitably than couples in the past.4 Some professional dual-income couples have even achieved rough equality in their domestic divisions of labor,5 and one-third of working-class couples work different, complementary shifts and share care of young children.6 A great deal of evidence also indicates that more fathers would adopt caregiving roles if they felt it was financially feasible to do so: For example, a 2007 survey by Monster.com found that 68 percent of American men would consider staying home full-time with their kids. The bottom line is clear: during the past decade, the number of caregiving fathers has risen dramatically. Dads now spend more time with their children than at any time since researchers started collecting longitudinally comparable data.7 This does not mean that Americans have achieved an egalitarian utopia. The census counts 5.6 million stay-at-home moms, compared to 159,000 dads.8 The University of Wisconsin’s National Survey of Families and Households says that the average mother is doing five times as much child care as the average father. When both parents work for pay, Mom still beats Dad by a four to one ratio.9 If men as a group have indeed increased their contributions at home--and they have --they still don’t come close to matching what mothers do. However, averages can be deceptive. They reveal the big picture but, by doing so, obscure the many smaller pieces and countertrends that give it shape. In truth, we are in a period of transition when inequality coexists with progress. Some groups of men have adopted flexible gender roles and embraced cooking, cleaning, and taking care of kids, while other groups have not. The negative examples, often glorified, are everywhere, while the positive ones are often hidden and hard to find, especially for boys and young men. home dads are a small but growing part of the landscape. 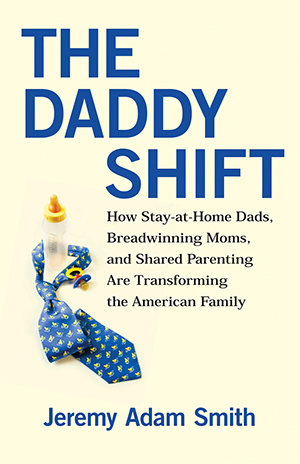 This is the “daddy shift” of the title: the gradual movement away from a definition of fatherhood as pure breadwinning to one that encompasses capacities for both breadwinning and caregiving. Stay-at-home dads are the leading edge of the daddy shift, pioneers who are quietly mapping new territory for all fathers. I focus on stay-at-home dads for the same reason anthropologists study lost tribes and obscure subcultures: to reveal the variety and potential of human experience--and thus to suggest new possibilities for organizing our lives. But in many ways, this book is really about male caregiving writ large. Stay-at-home dads represent one extreme of a continuum that includes the growing number of dads who split work and child care equally with their spouses, widowed or divorced custodial dads (a group that has quadrupled in size since 1970), two-dad families, and working fathers who have restructured their jobs in order to make more time for their children. Many of the facts, ideas, and trends I describe apply to all dads who have chosen to prioritize, for one reason or another, care over paid work. This is also a book about female breadwinning, which is, of course, the main economic factor that makes stay-at-home fatherhood possible. Prior to the 1960s, as we will discuss in chapter 1, it was uncommon for mothers to work and nearly unheard of for them to make more money than their husbands. Today, 80 percent of mothers have jobs and one-third of wives make more money than their husbands10--and we have every reason to believe that these trends will intensify: today in America, for example, young women outnumber men on college campuses, and they outearn young men in many American cities. As women’s incomes continue to rise--and they will--men will be called upon to do even more housework and child care. According to a growing number of studies, there is a direct relationship between the amount of money women earn and the amount of housework and child care men do. In 2006, for example, Pennsylvania State University sociologist Jennifer L. Hook analyzed forty-four time-use studies from twenty countries, and she discovered that men’s housework and child care increases with national levels of women’s employment, as well as the availability of paternity leave. Hook also found that widely available day care and preschool correlates with higher levels of father involvement.13 At first glance there might seem to be a conflict here: Wouldn’t more easily available child care limit men’s participation in raising their kids Wouldn’t one trend counteract the other In point of fact, day care and father care are not antagonistic categories. Though the pie representing total time with children might shrink for dual-income couples using paid child care, moms and dads must still find a way to slice up the hours and responsibilities that remain. And, as we will explore in chapter 3, in relatively egalitarian countries with subsidized, widespread day care and early childhood education, the pressure is strong for fathers to match mothers’ involvement. Most of the stay-at-home fathers I interviewed for this book--like many stay-at-home moms--pay for some amount of child care in order to do housework, work part-time for pay, search for jobs, take classes, or carve out time for themselves. Pitting paid care against stay-at-home parenthood sets up a false dichotomy. Child care isn’t just for working mothers; it’s for all parents. men can effectively take care of children and homes remains open. But, after thirty years of research and growing male participation at home, we are now beginning to understand that the answer is yes, they can. The stay-at-home dad is important because he sweeps aside myths and stereotypes about what men can and can’t do for their families, tears down the walls that divide men from their children, and fulfills the promise of feminism, which has always been as much about transforming gender roles as fighting inequity. Can we get to half ? Mahony thought it was possible for men to do half the work--day care and preschool don’t preclude the need for full participation--and I think it is too. Certainly men, women, and our entire society have a stake in the future of male caregiving.